The continued expansion of social media has led to a drastic change in the way that search engines compile results. Those persons who garner a reputation as being a leader in their field are going to continue to climb to the top of the results page, while those persons who fail to update their social media accounts and webpages with the latest pertinent information will inevitably suffer a decline. A new article provides a series of tips for persons looking to create content that will get them noticed as a power player in a given industry, and we’d like to offer you ways on how lawyers looking to expand their firm’s client base might utilize those tips. If you’re a lawyer, then you obviously already have an area of expertise. It’s important that you let the world know just what that expertise is and what qualifies you to speak about topics related to your practice area. To that end, create a blog and a social media account filled with your insights and knowledge, and keep abreast of the latest news in your field so that you always have something to speak out on. Breaking news offers a great opportunity for lawyers to offer their own unique take on a given topic, and not taking advantage of stories that relate to your practice area does a disservice to your firm. While focusing on the content itself, it’s also important to create a website that will be visually appealing to any potential clients. This doesn’t start and end with a basic web template that governs every page within your domain, though. Consider implementing infographics on a regular basis. They’re a great way to relate complex information in a relatively simple manner than anyone could understand. Videos and slideshows of you talking about various topics can also go a long way toward improving the user experience. Not only can these can be informative, but they can demonstrate that you’re well respected among your peers if, for instance, the video depicts you speaking in front of your fellow colleagues at a law conference. People coming to your firm’s website likely have a lot of questions, as they’re often going to be relatively new to the legal system. 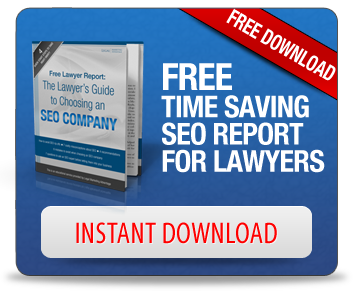 Answer their questions when they get to the site and they’ll be more likely to seek you out as their attorney. No doubt you’ve sat through many clients meetings where you’ve explained what to expect moving forward. Take what you already know to be typical questions and provide answers on your website. There’s no end to the number of ways to convey information to your potential clients. By utilizing a variety of media (blog posts, infographics, videos and more) to provide visitors with relevant insight into your area of expertise, you make yourself seem more authoritative and assure the client that they’ll be in the right hands.